The Feelfree Gravity kayak seat is unlike any other kayak seat on the market. This super comfortable, and super adjustable seat, will make all day fishing trips feel like you're sitting in your favorite chair. The Gravity Seat adjusts up to 10 inches high in 1 inch increments. The backrest is fully adjustable and even reclines. In the low position the seat sits almost flush on the deck of your kayak and is the perfect height for paddling. The high position is going to offer more visibility and will be more comfortable. There is a mesh side pocket for tackle or other storage. The Gravity Seat needs a wide footprint, 23 inches of deck space from side to side and 16 inches from front to back. It does not come with any mounting hardware. This seat was used as an upgrade from the original version Hobie seat for the 2011 Pro Angler. It took a little modification to a mounting bracket but it has worked flawlessly, and is (imho) the most comfortable version that can be used in and configuration for the Pro Angler line. It gives 10" of elevation adjustments to give you the best ride height for a multitude of situations. I have been extremely happy with this product thus far. Tried this one out today in the store. I like what they are trying to do here in terms of a mix of comfort and raise- able lower ability. It felt somewhat heavy and thick and the back support didn't go up high enough for a tall guy. Also didn't have much give to it and I though the raising and lowering was a bit clumsy. There were also a lot of instructions as to maintaining the chair etc so it seems like there is some maintenance that needs to occur. For the price point would like to see more comfort, more give, more back support and airier mesh/ more breathable. I could see getting fairly sweaty in this chair. Q: will this seat fit into my two 2015 Moken 12.5. replacing the kingfisher seat.?? A: This seat is only made to fit the Lure series from Feelfree. Q: One of the hex pins/bolts that hold the two seat legs together (at the X) unscrewed and I am currently unable to find it. I believe it came loose after using the seat adjustment strap a few times. Does ACK or Feelfree sell the replacement pins/bolts for the gravity seat? A: Hey, thanks for the question. If you don't mind, can you shoot us a few pictures over to customer@austinkayak.com? This would be the best way to find exactly what you're looking for. Q: Do you carry replacement seat covers for the gravity kayak seat for the Feel Free Lure? A: Unfortunately we do not carry the replacement covers for the Gravity Kayak Seat, only the replacement seat itself. A: Thanks for your question! Unfortunately we do not stock any seats that will set you up a little higher on the Moken. Q: How much does this seat weigh? A: Hey there, thanks for the question! The seat weighs about 17 pounds. Q: Will this seat fit my Weber 132 ? Q: Will this seat fit an Ocean Kayak prowler 13. A: This seat is not designed to work in anything other than the FeelFree Lure kayak. Q: I have a Wee Lassie canoe without a molded seat...just a "bare" bottom. Would this seat work in my boat? A: If your kayak has pad eyes or a place to attach the 4 buckles or clips to attach to this seat will work in your kayak without any modifications to the kayak. Q: Is it safe to assume this would work on a SUP if the bag leg where strapped down? A: If you strapped it down it would work ok.
A: this seat will work in the kayak as long as there is a mid ship pad eye on each side and 2 pad eyes to the rear of the seat well. Q: I have a hobie outback 2013...Will the Jackson Elite 2.0 kayak seat fit in my kayak? the 3.0? Thanks! A: Hi, Thank you for the question to ACK. The Jackson Elite 2.0 will not work on your 2013 Hobie Outback. This is only going to work on certain Jackson kayak models. The Feelfree Gravity seat will also, not work on the Hobie Outback. This is going to be specifically made for the Feelfree Lure series. Q: I own a Pelican Catch 120, it came with a seat similar to yours! I like the seat you have and the seat of the Pelican won't adjust as much also yours look more comfortable! So in turn I like to know if it will fit mine! A: Unfortunately, these seats will not be compatible by default, though you may be able to retrofit it on. Q: Will this seat fit in a Perception Pescador Pro 100/120? Q: will this seat on an eagle talon 12 kayak made by field and stream? Q: will this seat fit in a Field and Stream 12 ft. Eagle Talon? A: Hi, Thank you for the question,. This is not going to be a seat that we would recommend as a seat replacement for this kayak. Our concern is that the kayak you were referencing uses padeyes or small d-rings to attach the seat with a clip or buckle. This is not to say that this is not possible, however we are not going to recommend this seat for a seat replacement. I would recommend something like the comfy captain. A: Hi, Thank you for the question. 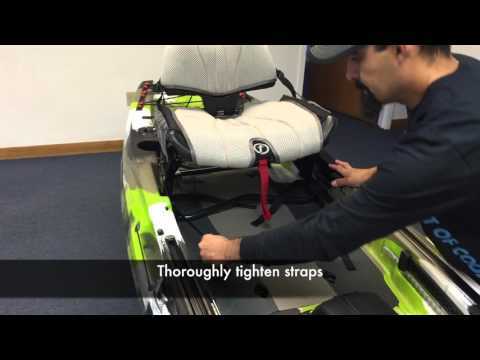 The Feelfree Gravity seat is not going to be the "ideal" seat for the Hobie Pro Angler. Will it fit? Hobie would say no. We do not recommend it. There are no official documents that recommend this product as a seat upgrade. Q: Will this fit a vibe sea ghost 130? A: Unfortunately we cannot be 100 sure since we are unable to test the fit on a Vibe kayak. Most likely it will fit since this seat model is used by other customers in non Feel Free kayaks. Q: Will this seat fit into the 2016 moken 12.5? A: The Moken 12.5 is not compatible with high seats without modification. Q: Will this seat fit the tarpon 120? A: Unfortunately, this will not fit the tarpon 120 as FF and Wilderness Systems have different seat designs which are not interchangeable. Q: Would this fit on the FeelFree Moken 10 Lite Kayak? A: This seat is not compatible with the Moken series. However, the Moken series does come with the Kingfisher seat which is very comfortable. Q: Will this seat fit into an Emotion Stealth Angler 11 foot kayak? A: unfortunately this seat is designed specifically for the feel free kayaks, and would not fit in your boat. Q: will this fit the field and stream eagle talon? A: Yes it will fit. Q: I have a Trident 11' Angler and wondered if this seat would fit? A: It would fit on the seat well but the kayak is not designed to take that seat and the aluminum could wear out the where it seats and break the polyethylene. Q: Will this seat be able to replace the king fisher seat in the moken angler 10? Would I probably have to make mods to make it fit? Thanks. A: Unfortunately the seat molding on the Moken series is not able to accept the Gravity Seat. As far as modifying your kayak to fit this seat, I honestly cannot give suggestions on this matter. Just for more information as well, modifications to your Moken kayak may void the warranty. Q: My buddy has a Hobie Outback/2012 Will this seat fit in his seat area? Fastening down would be his DIY, but needs to know if it fits into the seat well area. Thanks!! A: It will fit but keep in mind the likely modifications you would need to make this sit flat within a 23 inch area side to side and 16 inches front to back. A: Unfortunately, this seat is designed specifically for the Lure line of FeelFree boats. This will not fit the Ocean Kayak Scrambler.